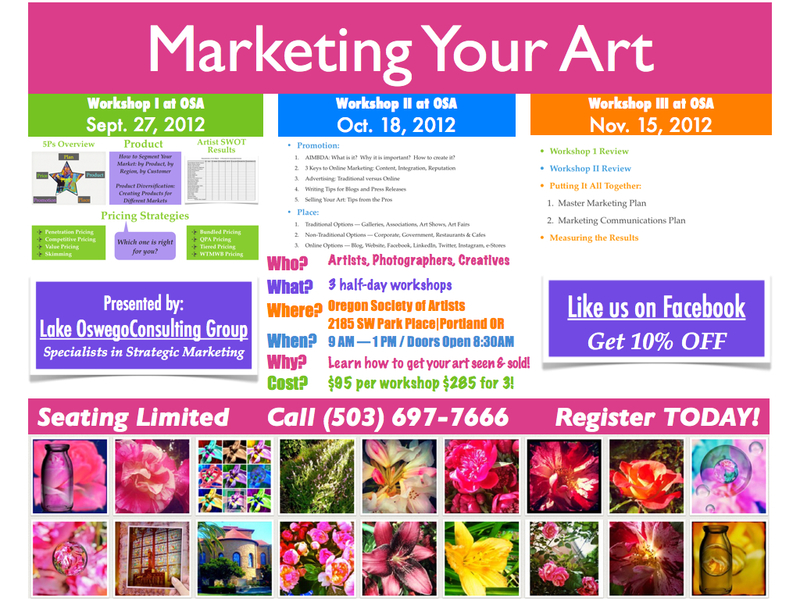 Lake Oswego Consulting Group is please to announce that Marketing Your Art Workshop III will be held at Oregon Society of Artists on November 15, 2012. In this half-day workshop from 9:00AM to 1:00PM, you will learn how to create a realistic and effective marketing plan for your art business; how to identify and recruit the people that you need to put it in place; how to get started on a shoestring budget and manage your resources, review a case study art business from concept to marketing plan and much more! Please join Anna Porter and George Porter, the senior consultants and fine artists at Lake Oswego Consulting Group for the third and final Marketing Your Art Workshop to be held at Oregon Society of Artists, 2185 SW Park Place, Portland, OR 97205. Seating is limited and advance registration is recommended. Please email info@lakeoswegoconsultinggroup.com or call (503) 697-7666 to register TODAY! 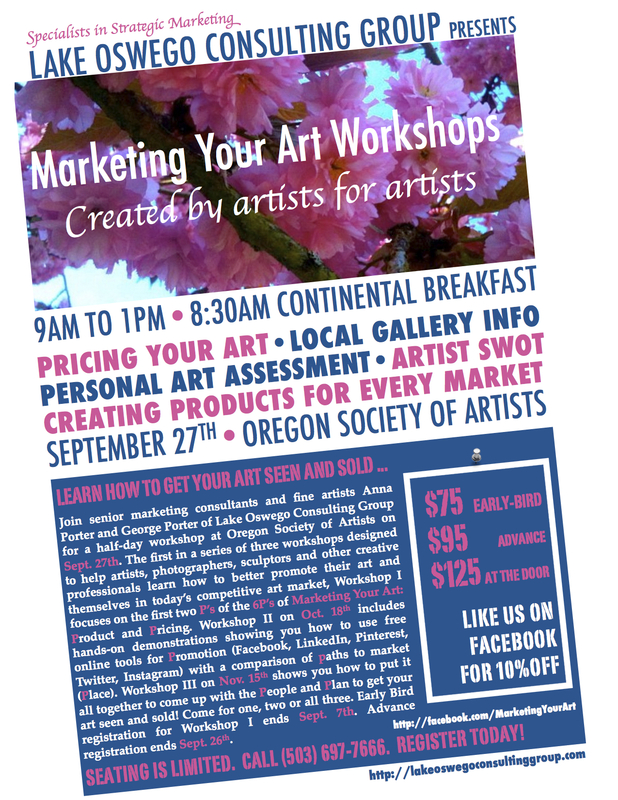 Don’t miss this workshop by Lake Oswego Consulting Group at Oregon Society of Artists, 2185 SW Park Place, Portland, OR 97205 on October 18, 2012 designed by artists for artists to help you market and sell your art, photography, sculpture and crafts! 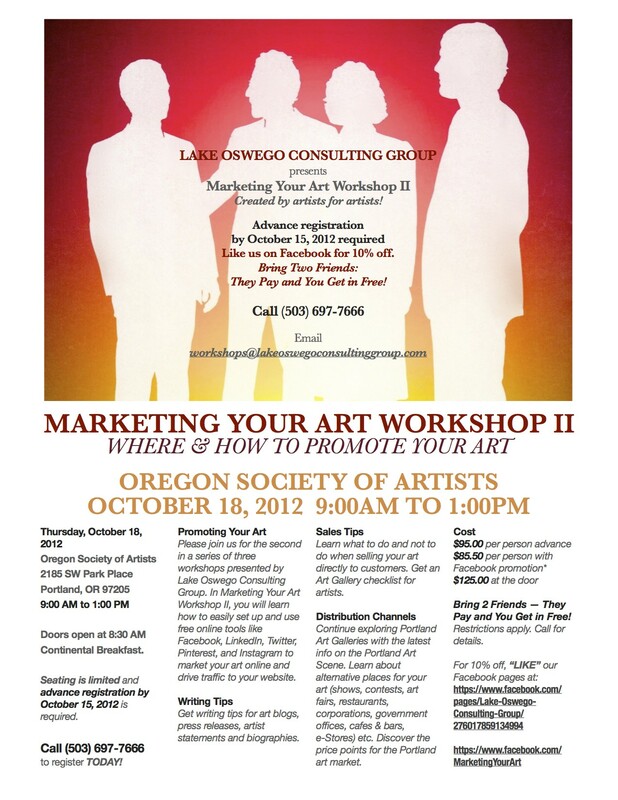 For more information please see the poster above or email workshops@lakeoswegoconsultinggroup.com. Seating is limited, so call (503) 697-7666 to register TODAY! Advance registration by October 15, 2012 is required and we have SOME GREAT PROMOTIONS going on right now! JOIN OUR FACEBOOK EVENT for up-to-the-minute information and while you are there, like our Marketing Your Art Workshops page and Lake Oswego Consulting Group Company page on Facebook to SAVE 10% on Marketing Your Art Workshop II! Doors open at 8:30 am, and workshop participants are invited to join us for a continental breakfast from 8:30AM to 9:00AM. While Marketing Your Art Workshop I focused on creating products for every market and pricing your art, Marketing Your Art Workshop II will be devoted to the subject of promoting your art and determining the best places for distribution. Workshop participants will learn how to use new technologies, skills and tools to effectively promote your art online and create a strong internet presence. In the first half of Workshop II, Anna Porter will show you how to quickly set up and optimize social media like Facebook, LinkedIn, Twitter, Pinterest and Instagram to improve your online presence and drive traffic to your website. Workshop attendees will get tips on writing art blogs, press releases, and tweets, as well as selling tips from the pros. In the second half of Marketing Your Art Workshop II, we will compare places of distribution for your art – both traditional and non-traditional, and discuss channel strategies. Finally, George Porter will present the Portland Art Scene, Part II. In Marketing Your Art Workshop I, George introduced Workshop I participants to a new database of Portland Art Galleries that he is researching and developing. We will wrap up Marketing Your Art Workshop II with a continuation of this presentation, highlighting new galleries and other venues that are available to artists as part of the lively Portland Art Scene. 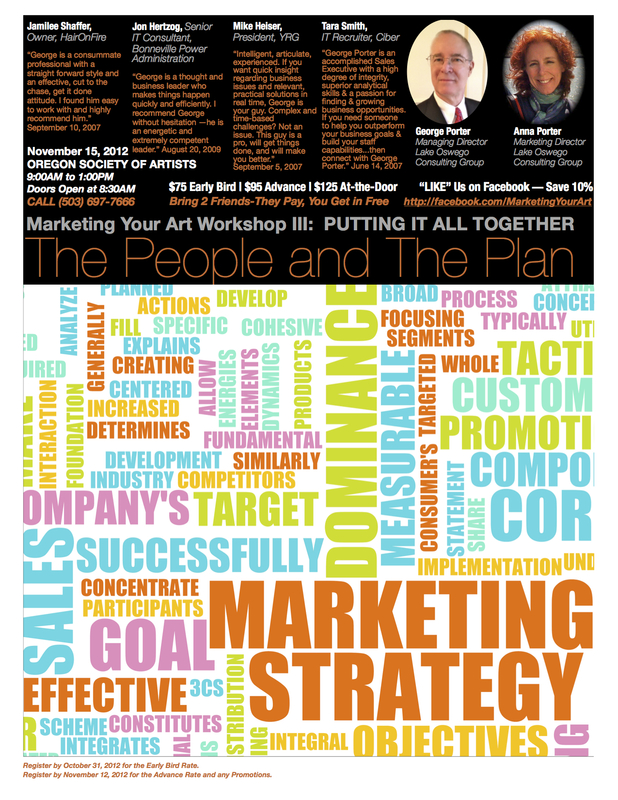 In Marketing Your Art Workshop III on November 15, 2012, we will put everything together that we learned in Workshop I and Workshop II to create your personal master marketing plan and define the resources and people you need to successfully implement it. All promotional rates require ADVANCE REGISTRATION AND PAYMENT. Please email: workshops@lakeoswegoconsultinggroup.com or call us at (503) 697-7666 to register. If you have any questions, please call Anna Porter or George Porter at (503) 697-7666. 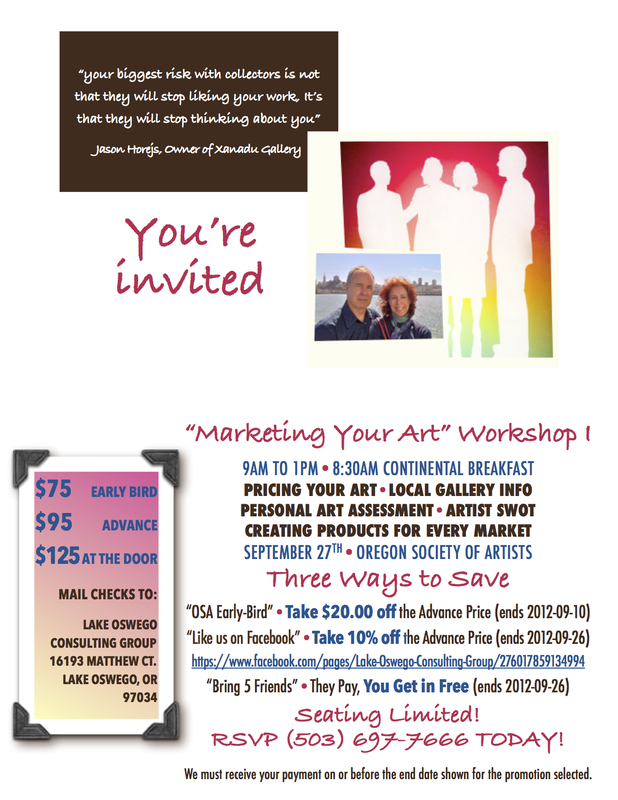 We are looking forward to seeing you at Marketing Your Art Workshop II! Your personal invitation to the first of three Marketing Your Art Workshops specifically for artists, photographers, sculptors and other creative professionals. 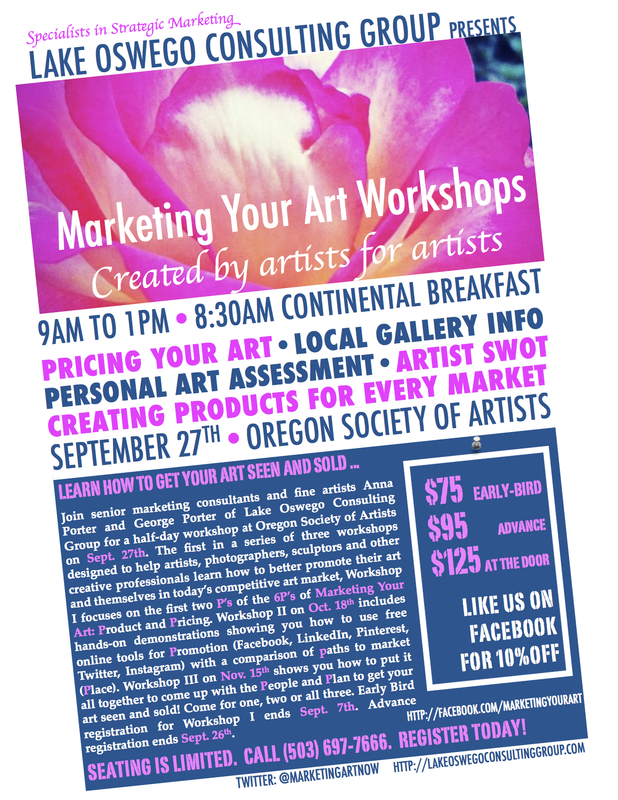 This is the new poster for Lake Oswego Consulting Group’s Marketing Your Art Workshop I to be held at Oregon Society of Artists on September 27, 2012 from 9AM to 1PM. 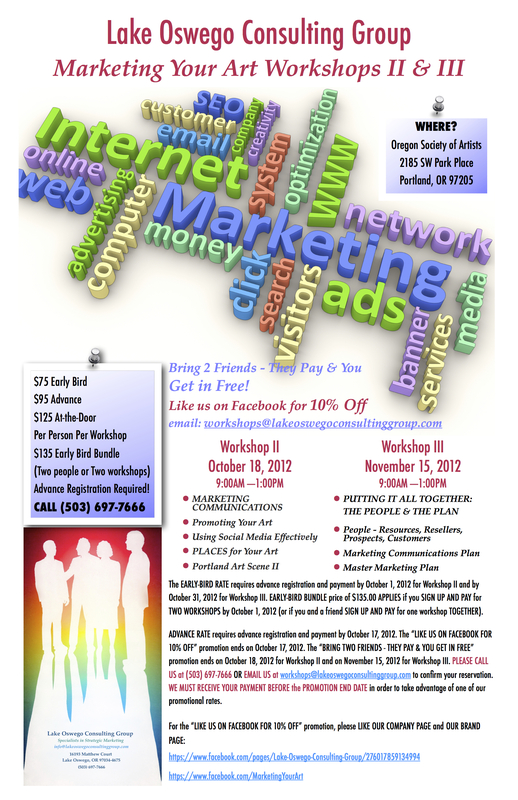 Please note that the Early-Bird promotional rate of $75.00 for this workshop ends this Friday, September 7, 2012, so be sure to call us at (503) 697-7666 before Friday to get the best rate on this awesome marketing workshop for creative professionals. Questions? Call Anna Porter or George Porter at Lake Oswego Consulting Group at (503) 697-7666 or (503) 360-7260 with questions or to register. You may also email us at the workshop email address lakeoswegoconsultinggroup@gmail.com or at our corporate email address info@lakeoswegoconsultinggroup.com. Recently I read a blog where someone was trying to compare the pros and cons of having an art gallery represent your work or not, and asking the question “Was 50% too much to pay for the honor – in short was it usury? I tried to post my comment there and could not do so successfully – Captcha kept kicking me out, even though I responded correctly several times. I am not sure why this is happening, Apple, but it is really annoying! So, I thought I would write my own blog on that same topic myself. In my opinion, it comes down to this: If the art gallery is actively promoting and selling your work and it is working, then 50% of something is better than 100% of nothing. Yes 50% is an outrageous amount to have to pay. But if the gallery is well-located so that it has great foot traffic in an area with enough of your target audience who are likely to want to buy your art; if it actively promotes its artists both in the gallery and online and is staffed with knowledgeable, customer-friendly, people who actually do try to sell your art; if it understands and represents you and your art, and other artists and their art, honestly and knowledgeably, then I believe it is definitely worth it. Expensive but worth it. And you must keep in mind that the gallery has fixed overhead and up-front costs associated with promoting your work that it pays out-of-pocket regardless of whether or not your work sells. So while 50% may seem high (and is high), the gallery assumes 100% of the up-front costs – costs that you would otherwise have to cover yourself. I would suggest; however, that you check up on your chosen art gallery from time to time to make sure that once the honeymoon is over, it really is doing a good job of trying to promote and sell your art. I found out later that the “bread and butter” for the gallery was selling famous signed prints. The owner was “in the back” on the telephone working hard to sell those prints. But no one was working hard “in the front” to sell the local artists’ works that were hanging on the gallery walls. The “in the front” person might as well have been “in the back” too. I walked next door into another gallery. I looked at three paintings briefly, and turned my attention to some sculpture. Immediately a friendly, smiling gallery representative approached me to give me some information about the artist. There was no high pressure sales pitch. Just some exciting news about national recognition for the artist. She was obviously thrilled with the prospect for the artist that she represented. Her willingness to “break the ice”, gave me the courage to ask her some questions about some of the other paintings and artists. And a conversation ensued. I learned a lot about the artists who were represented there. I was not, ultimately, a buyer. But if I had been, and I had liked the art on the walls, and maybe even if I was unsure about it, I would have bought a painting there. Because the person that approached me was sincere, knowledgeable, not pushy, attentive, honest, understood the artists that she represented, and clearly knew a thing or two about art. You get the picture. Which gallery would you rather have representing you? I cannot stress enough how important it is to do your gallery homework before you decide to approach one to represent your work, or how important it is to have a local gallery that you know and can visit frequently. While I totally understand a gallery’s need to focus its efforts in selling what it needs to sell to cover its fixed costs and make a decent profit, I really felt like Gallery #1 was doing a disservice to the local artists whose works were hanging on its walls. Walls do not sell paintings. People sell paintings. So make sure that your gallery has someone “in the front” who is knowledgeable, courteous and likes people. Someone who actually will greet potential customers and try to get a conversation going around your work. Someone who is motivated to do so in order to get paid. If not, then you really would be better off selling your art any other way, like holding it out on the side of the I-5 freeway with a “For Sale” sign on it, because at least someone would be trying to sell it. For those of you who would like to augment your gallery representation by learning how to market and promote your art and yourself online, I recommend that you consider the “Marketing Your Art” Workshops developed by Lake Oswego Consulting Group. A series of three workshops will be starting in Portland, OR on September 27, 2012 at the Oregon Society of Artists. For more information, please refer to the poster below and this blog entry. This is a link to a blog with a great infographic showing the different types of people who influence social media. Think of it like a social media personality type. Call (503) 697-7666 to Register today! Time: 9:00AM to 1:00 PM for all workshops. Doors open at 8:30 AM and continental breakfast will be served from 8:30AM to 9:00AM. This series of workshops is ideal for artists, photographers, sculptors and other creative professionals who want to learn how to better promote their art and themselves in the digital age. It is based on the six principles of marketing: product, price, promotion, place, people and plan and has been designed by artists and senior marketing consultants, Anna Porter and George Porter at Lake Oswego Consulting Group. Please refer to our brochure and to our blog post on August 21, 2012 for complete details. Seating is limited to 50, and registration has begun. For more information and to register, call (503) 697-7666 or email us at lakeoswegoconsultinggroup@gmail.com. Join our Facebook Event for Workshop I! 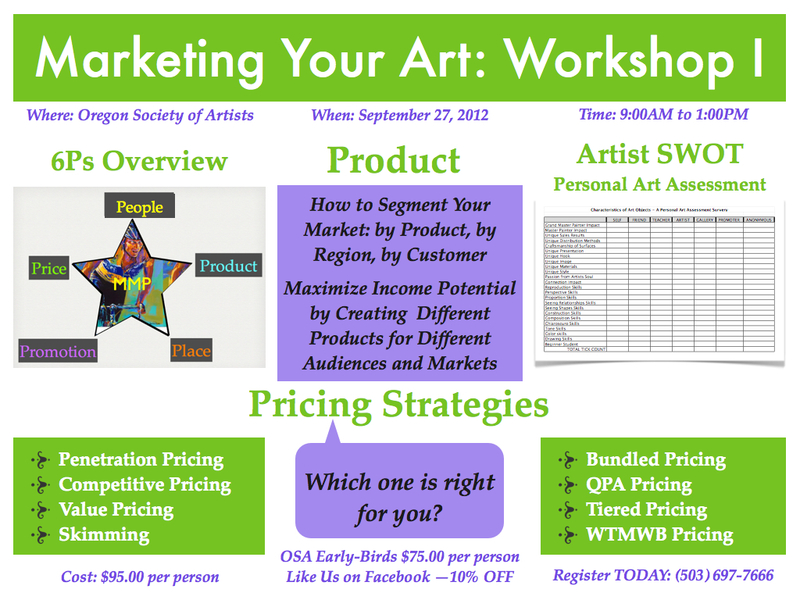 The first workshop in the “Marketing Your Art” Series of Workshops developed by Lake Oswego Consulting Group for artists, photographers, sculptors and other creatives will be held at the Oregon Society of Artists in Portland, OR on Thursday, September 27, 2012 from 9:00 AM to 1:00 PM. Doors open at 8:30 AM and all Portland-area artists and creative professionals are invited to join us for this exciting event. Breakfast will be served from 8:30 AM to 9:00 AM. This first workshop is designed to give artists an overview of the 6Ps of Marketing – Product, Price, Promotion, Place, People and Plan. Marketing Your Art Workshop I will focus on the Product and Price aspects of Marketing Your Art in more detail. Attendees will be emailed a Personal Art Assessment form to complete prior to attending Workshop I. 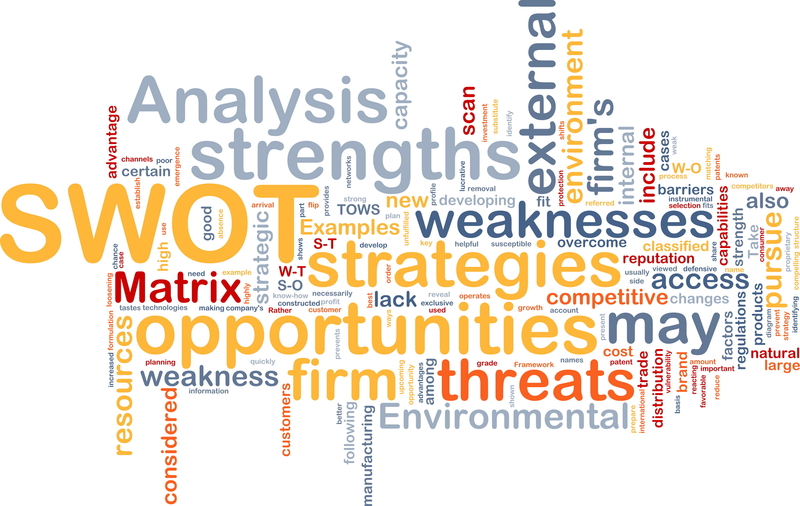 As a group, we will look at how this information can be used to help artists assess their strengths, weaknesses, opportunities and threats in an Artist SWOT Analysis. Guest speakers, George Porter and Anna Porter of Lake Oswego Consulting Group will then discuss how to segment your market and target specific audiences based on your product, region and customer demographics, and they will share great ideas on how to broaden your product offering to increase income at any stage in your career. In the second half of this workshop, artists will learn several pricing strategies for their art, when to use them at various stages in their professional career, and how to position their art and themselves in the competitive art market. The format for this and all of the “Marketing Your Art” Series of Workshops developed by Lake Oswego Consulting Group will include hands-on demonstrations, group discussions, slide and video presentations. Attendees will be given several useful tools and a complete set of all presentation materials to help them get the most out of these in-depth workshops. The cost for Workshop I is $95.00 per person. CALL (503) 697-7666 TODAY to reserve your place, as SEATING IS LIMITED TO 50 participants. Payment is due by September 6, 2012. Like Lake Oswego Consulting Group on Facebook and receive a 10% discount on any “Marketing Your Art” Workshop offered by Lake Oswego Consulting Group! Just mention the “Like Us on Facebook” Promotion when you call to register. For more information and to reserve your seat TODAY, please contact Anna Porter or George Porter at Lake Oswego Consulting Group at (503) 697-7666 or email lakeoswegoconsultinggroup@gmail.com. Doors open at 8:30AM and attendees are invited to join us for breakfast from 8:30AM to 9:00AM. SEATING IS LIMITED TO THE FIRST 50 PEOPLE WHO CONFIRM REGISTRATION at (503) 697-7666! Cost for the workshops is $95.00 per person per workshop or $285.00 per person for all three! Payment is due by September 6, 2012 to hold your reservation. LIKE US ON FACEBOOK and receive a 10% DISCOUNT ON THE WORKSHOP FEES! Just mention the “Like Us on Facebook Promotion” at the time of registration. There is no cost to register and seating is limited to 50 participants. Payment is due on September 6, 2012 to hold your reservation. If you are an artist in the Portland metropolitan area, or you know someone who is, and you would like to learn how to better promote your art and yourself online, please call Anna Porter or George Porter at Lake Oswego Consulting Group at (503) 697-7666 or email us at lakeoswegoconsultinggroup@gmail.com for more information or to register.